Used to attach to other ships or to stations for docking. Also useful for towing other ships as well. It can be set to automatically lock onto surfaces or manually. Operated when piloting a ship; maneuver the ship such that the landing gear is in range (it will be indicated on the HUD, as well as by the ring around the foot turning yellow, then press P (default) to lock the landing gear. 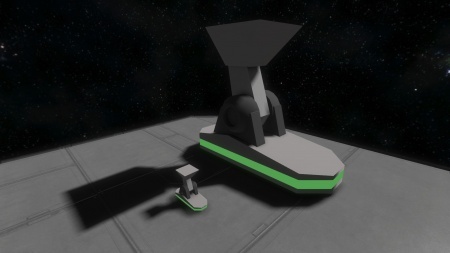 The ring around the foot will turn green to indicate that it is locked, and the ship will be attached to the target. You can then press P again to detach. Landing gears can be set to "Auto-lock", which is the mode they are in upon construction. In this mode, the color stripe turns light blue and the landing gear will lock automatically to any surface that comes into magnetization range. The maximum force a landing gear will absorb can be adjusted in the control panel. If this force is exceeded, the landing gear will unlock itself. If set to "Unlimited" the landing gear will not unlock. If the force on the landing gear gets too high for the structure to handle and it does not unlock, it will explode. When landing gear is toggled off in the control panel, the ring around the foot will turn red and keep whatever locked or unlocked state it was in before being shut off. Unlock - Detaches the landing gear from a surface. If autolock is enabled, you must disable it. Otherwise it will quickly lock. Autolock - Automatically will lock onto a surface when it is within range. This is its default setting upon construction. If built on another ship, the landing gear will automatically start pre-attached. If you're using the Jump drive on a large ship, your smaller ships can attach themselves to the large one with landing gears. This will allow them to tag along for the ride. There are no 100% workarounds yet. But some things should be considered when using landing gears. setting the max force to a value < Unlimited can reduce their tendency to explode. However, the docked ship might still come loose at some point. Setting them to "auto-lock" in this case might be worth to try. This page was last modified on 16 September 2018, at 20:34.